A client's spare bedroom that was used as a placeholder -- or should we say, placeholder's', for seasonal clothes, computer, shoes, picture frames, pictures, art supplies, emergency water...etc. etc. So, the room really didn't have a purpose except to collect "piles". The process included the purging and sorting. That means take everything out and put into categories. 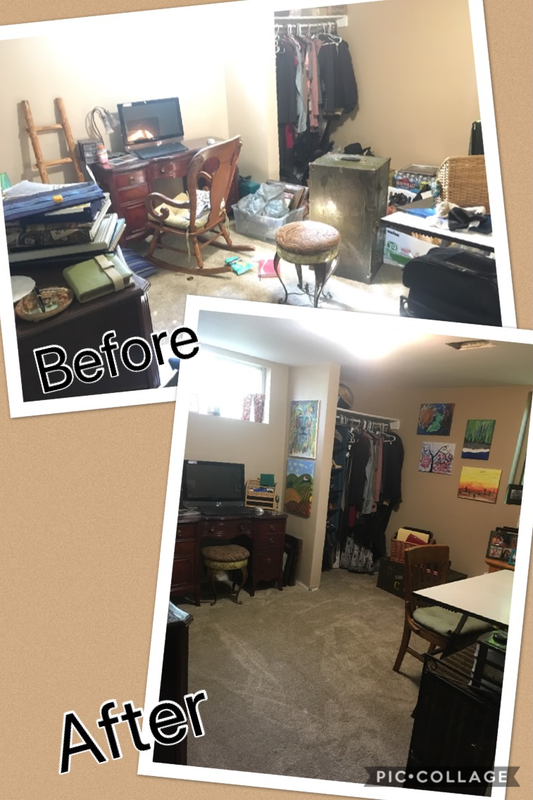 Once we saw how much of each category there was, what was retained vs. let go (either trash or donation), and clarify the purpose of the room, it was time to put it back together. It's okay to have a room for storage. It's okay to split a room for several purposes. Knowing what the room would be used for helps to know where each category's home would be. A simple and effective step is to then place the items near it's functioning area. The room was to be used for gaming, creativity, and storage. Each category than gets a home assigned to it. We turned the piles into homes. If looking at the "before" picture hurts your head, makes your breathing tight, or that you just want to look away, imagine what kind of energy (negative) and how much energy is sucked out of your day. If looking at the "after" picture makes your head feel happy, allows you to take a breath of fresh air, and possibly even smile, image what kind of energy (positive) and how much energy fills your day.